(BARAM RIVER / MALAYSIA) Sarawak Cable, a company closely linked to the family of Sarawak Chief Minister Taib Mahmud, has been granted two new contracts to develop transmission lines in Sarawak worth RM618.6 million (USD 196 million), the Malaysian press reported today. Sarawak Cable is chaired by Mahmud Abu Bekir, the elder son of Sarawak Chief Minister Taib Mahmud. According to company documents, the Sarawak strongman’s son is both chairman of Sarawak Cable and its second-largest shareholder with a 33% stake in the company (21% held directly and 12% indirectly). The Bruno Manser Fund is dismayed that Sarawak Energy under its Norwegian CEO, Torstein Sjøtveit, continues with the corrupt practice of favouring the Chief Minister’s family. Already between 2010 and early 2013, Sjøtveit had granted over 220 million USD in contracts to Taib family-linked enterprises. Sarawak's Taib Mahmud is back in the limelight after family-linked company awarded RM600 million contract by state-owned company. - The Malaysian Insider pic, October 31, 2013.A company linked to the family of the Sarawak Chief Minister has been awarded a contract worth RM618.6 million by state-owned dam builder Sarawak Energy to develop transmission lines in the state, drawing criticism from a Swiss-based environmental group. The Bruno Manser Fund (BMF) – a group which has been critical of Sarawak's policies on its indigenous people – said Tan Sri Abdul Taib Mahmud's eldest son, Mahmud Abu Bekir, is the chairman of Sarawak Cable Bhd (SCB), whose subsidiary won the contract. "According to company documents, the Sarawak strongman’s son is both chairman of SCB and its second-largest shareholder with a 33% stake in the company (21% held directly and 12% indirectly)," said BMF. "Both projects are expected to contribute positively to the earnings and net assets of Sarawak Cable Group for the financial years ending Dec 31, 2014 and 2015," SCB was quoted as saying. The Sun daily yesterday reported that stock exchange authorities in Kuala Lumpur were informed by SCB that its subsidiary company – Trenergy Infrastructure Sdn Bhd – had received a letter of award for two 500kV transmission line projects in Sarawak, from Mapai to Lachau and Lachau to Tondong. BMF said the awarding of the contract could not have come at a worse time, referring to the stand-off between native communities and the state over the Baram Dam construction by Sarawak Energy. The dam, one of 11 new dams being planned by the state government throughout Sarawak, will see the evacuation of 20,000 natives from the Kenyahs, Kayans and Penans ethnic groups. Villagers had set up protests and blockades around the site of the Baram Dam, preventing Sarawak Energy workers from entering the area. "Native communities scored a victory when their blockades forced Sarawak Energy workers to halt survey works for the planned Baram dam," Straumann had said. Meanwhile, The Star quoted Telang Usan's Barisan Nasional state assemblyman, Dennis Ngau, as saying that the situation on the ground was "very hot" following no sign of the natives backing down. The politician claimed he was worried the matter would "boil over into a physical confrontation", urging restraint through a "cooling off period". "Stop all ground works for the time being until further notice. Don't confront the protesters. Leave it to us politicians to find a solution," Ngau advised, referring to rock drilling works between Long Naah and Long Kesseh, some 200kms inland from Miri City. Ngau said he had also cautioned Sarawak Energy and officials from the state Land and Survey Department to stay away from the site for now. - October 31, 2013. Sarawak Energy Berhad (SEB) has been issuing “Blanket Statement” with regards to payment of compensation to the Penan communities affected by Murum dam hydroelectric project (MDHEP) in Belaga District, Sarawak. SEB claims that the affected Penan communities stand to receive over RM600,000 per family in longhouse and infrastructure facilities as well as compensation upon being resettled. In summing up, SEB stated that “for longhouse and infrastructure facilities alone, the cost involved is RM213.3 million and this translates to more than RM600,000 per household. Borneo Resources Institute Malaysia (BRIMAS) has conveyed the news accordingly to the affected Penans in Murum about the so-called payment of compensation as widely claims by SEB. The Penans were shocked with such claims which to them are all rubbishes. With this, BRIMAS would like to clarify several points regarding the so-called payment of compensation to the Penan communities affected by Murum dam hydroelectric project (MDHEP). These facts will hopefully clear the misinformation and manipulative communication that were being issued by Sarawak Energy Berhad (SEB) which simply mean to mislead the affected Penan communities and the general public. According to the Penan they have no knowledge at all about the RM213.3 million, the cost of longhouse and infrastructure facilities which has being accounted as compensations without their consent. Many of the Penans argued that the government has assured them of the longhouses, infrastructure facilities and any amenities at the Metalun and Tegulang Resettlement site are built free for them without any charges for the well-being and betterment of their community. The Penan are saddened and regrettable indeed that the government failed to abide by the assurance made earlier. They questioned the sincerity of the state government and SEB which always claim to be transparent in all matters relating to Murum Dam project when the so-called RM213.3 million cost of development being accounted as compensations that have been shrouded in secrecy. Mr Ngang Buling, Chairman of Peliran-Murum Penan Affairs (PEMUPA) Committee vehemently refuted such claims as there is no truth in the said news. He said that none of the Penan has ever received such huge amount of cash compensation for loss of their lands, burial grounds, houses, crops, traditional forest resources, and etc. Ngang added, “If it is true that the Sarawak state government and SEB have paid or agree to pay us the amount of compensation as stated in their demands, hence there would be no persistent and on-going road blockades and protest at Murum dam site by the Penan”. On 16th October, the Penan representatives were called to a meeting in Bintulu town with YB Liwan Lagang, the Asst. Minister of Culture and Heritage (also the State Assemblyman for Belaga), Mr. Abdul Halim, the Belaga District Officer and the personnel of the Kapit Divisional Resident Office as well as the SEB representatives. At the meeting the Penan were told that they are offered only RM16,000 in compensation per family, which they have straight away rejected. Village Headman TK. Abok Jalong slammed SEB’s statement that alleged the Penan being instigated by NGOs to remain at the Murum dam site in order to pressure the government with their additional demands of RM500,000 cash compensation. It is most unwelcoming to note “the arrogant attitude of SEB for accusing the Penan being instigated by NGOs where the Penan are just exercising their rights to be heard when they had been sideline and their plight continuously taken for granted”. Headman TK. Abok condemned such wild allegations that belittle them of their fundamental rights to speak up for themselves and their prerogative to demands for just and fair compensations. He clarified that the Penan have not make any additional demands but has been consistent in their demands to the government including the RM500,000 cash compensation per family. Further, Headman TK. Abok pointed out that among their demands are 25 hectares of farming land for each of the Penan families affected by the dam; 30,000 hectares of forest area as communal reserve to each of the seven affected Penan villages; 10% royalty of Murum Dam revenues, education fund for their children; community development fund for the Penan community; and ownership rights to land and forest area which are not flooded (islands created) by the MDHEP. BRIMAS is very perturbed by such blanket statement of Sarawak Energy Berhad (SEB) that tantamount to confuse and mislead the general public on the amount of compensation to be received by the Penan. It seems that SEB failed to understand and differentiate between the issue of just, fair and equitable compensation and the development costs of Murum Resettlement project. Even a layman knows that the RM213.3 million are the costs expensed related to development and construction of structural buildings, infrastructures and amenities facilities at the Metalun and Tegulang Resettlement sites for the affected Penan villages. BRIMAS opines that the Sarawak state government and SEB should be solely responsible and account for the development costs of the Murum Resettlement sites rather than surreptitiously included these costs as compensation package of the Penan. BRIMAS sees this as very unfair treatment and unethical deed of SEB and the state government for not genuinely engaging and consulting the affected Penans at all level of the community on the entitlement and right to compensation matters. All this while, the affected Penan communities have forwarded their demands very clearly to the state government where they simply demand just, fair and equitable compensation for losses of ancestral land, properties, burial grounds and forest areas arising from the acquisition of their land by the government to make way for the construction of Murum dam hydroelectric project. Raymond Abin, Regional Coordinator of Borneo Resources Institute Malaysia (BRIMAS) strongly support the demands of the affected Penan communities to be entitled to "full compensation" so that they are left in a no worse position, than they were before the Murum Dam project commenced. This means that the Penan will not be deprived of their land without just, fair and equitable compensation. At present there are more than 200 Penan families on rotational basis manning road blockades, protesting and encamped at the Murum dam project site since 20th September. These families are from the Penan villages of Long Luar, Long Tangau, Long Menapa and Long Singu in Pleiran River of upper Murum area. Raymond Abin sees the protests as a positive movement as the Penan are not violent and only exercising their rights to call on government for negotiation on terms to their demands peacefully. As stated in Article 13 of the Federal Constitution the government has a legal liability to compensate the Penan for properties lost and acquisition of their land for the construction of Murum Dam hydroelectric project. Raymond appeals to the government and SEB not to take an ostrich stand on these Penan’s demands and compensation issue by hiding its head in the sand and assume that there is no problem if they don’t see it. 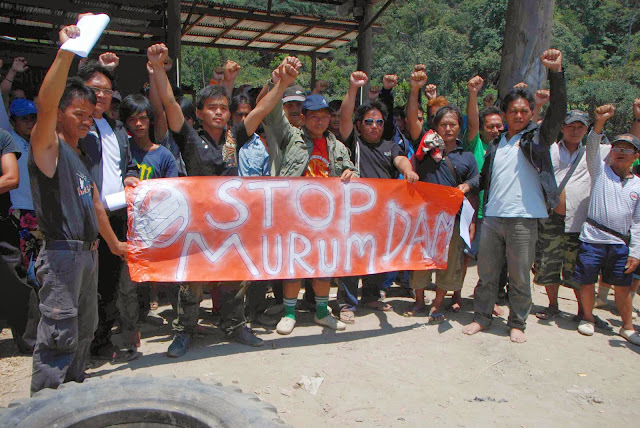 “The Penan will continue to assert their demands until the government holds genuine consultation and negotiation with them to agree on terms to their demands that may resolve the on-going impasse at Murum dam site”. Raymond Abin expressed dismay that the state government and SEB purportedly pretending not to know the demands of the affected Penan communities. And hope that the government will not continue to be silent, let’s take the bull by the horn and face the consequences, whatever their demands are - all reasonable that shall guarantees toward sustainable livelihoods for them. The state government and SEB should not forget that the Penan have sacrifices everything - their lives, lands and properties for MDHEP and the development Sarawak Corridor of Renewable Energy (SCORE). Note: Borneo Resources Institute Malaysia (BRIMAS) is a non-governmental organisation (NGO) that advocating Indigenous Peoples rights and environmental justice in Malaysia as well as the Island of Borneo. It is a Malaysian based NGO in Miri, Sarawak. Former dam project director says safety and environmental compliance standards of Baleh and Baram dam project are obsolete. KUCHING: People living downriver from the existing and proposed dams in Sarawak might be exposed to fates similar to the victims of the recent Cameron Highlands disaster. NGO Save Rivers Network Sarawak president Peter Kallang claimed this was because the safety and environmental compliance standards in the state were out of date. Having agreed that standard operating procedures (SOPs) for dams in Sarawak should undergo a serious review following the Cameron Highlands tragedy, Kallang told FMT that the fact (obsolete standards) was acknowledged by the very man that was supposed to direct the building of three of the proposed dams. “Andrew Pattle, who was the construction director for Murum Dam, and was supposed to direct constructions of the Baleh and Baram dams as well, had said in a Hydro Tasmania annual report that safety and environmental compliance of dam-building in Malaysia were not given much concern. “He also said what is currently being practised here had actually been used in Australia decades ago,” Kallang told FMT when contacted. Pattle, a long-term Hydro Tasmania executive, was actually “on loan” from the Australian corporation to Sarawak Energy Bhd (SEB) to assist the Sarawak state government realise its dam programme. The Australian was made the project director of the 1,250 megawatt Baram and Baleh dam projects as well as the 944 megawatt Murum Dam. Pattle, however, left the controversial dam programme in November. The Bruno Manser Fund speculated that his swift exit from Sarawak was a hint that Hydro Tasmania’s employees were starting to sense the strain from a successful international campaign against the Sarawak dam programme. “Constructions made by man will always have faults. Anything can have problems and human errors do happen,” Kallang said about the proposed dams. He further said that the existing safety and environmental compliance standards for dam-building practised in Sarawak were already archaic and should no longer be used in advanced countries, which Malaysia should not be excluded even though it was a developing country. “In relation to the (Cameron Highlands) disaster, it shows that they have problems with the operating procedures. But here in Sarawak, they may have problems with the construction procedures. They (the procedures) are obviously faulty. “Therefore, the people living downriver from the dams are exposed to potential dangers,” Kallang said. Three died in a flash flood last week after the Bertam River burst its banks when water was released from the Sultan Abu Bakar Dam in Ringlet, Cameron Highlands on early Wednesday morning. About 80 houses on the fringes of the Bertam River were swept away by strong currents after the river abruptly overflowed when water from the dam was released. It was reported that water from the dam in Ringlet had to be released to prevent the dam from bursting, following incessant heavy rains since 7pm the day before. The first release of the water was made at midnight, then at 1am and 2.45am which caused the Bertam River to burst its banks and caused the flash flood. Meanwhile, Kallang also updated FMT on the blockade staged by the protesting native landowners in Baram. He said in the early evening yesterday, all the construction workers’ machinery had left Long Lama, where a group of natives had blocked the cement trucks and stopped the workers from constructing the access road to the proposed Baram dam much earlier. As he was talking to FMT at 5.30pm yesterday, Kallang said two tractors and four excavators were being moved out of the area. “At the moment, only 30 Land and Survey staff and 15 police personnel remained at Long Lama. They said they will leave this place tomorrow (today),” Kallang said, adding that the blockade was staged by about 100 natives of Kenyah, Kayan and Penan ethnicity from Baram. Earlier today, Kallang sent press alerts to the media, informing that the Land and Survey staff and police had left the site. The projected RM4 billion Baram Hydroelectric dam project was part of the Sarawak government’s Sarawak Corridor of Renewable Energy (Score) project and its reservoir would eventually usurp 39,000 ha of land where no less than 20,000 people from the 26 longhouse communities would be relocated upon the dam’s completion. OUTSPOKEN: No further action. No through road. Cul-de-sac. End of the road. These seem to be the bottom line after all the hype about the explosive Auditor-General’s Report 2012. And who can blame us for having such impressions? For one thing, the Chief Secretary to the Government Datuk Seri Ali Hamsa has been reported to have said that the government would form a committee to study the Auditor-General's findings as if they were not clear and insufficient. The Malaysian Anti-Corruption Commission has gone on record as saying that there is no law to prosecute the offenders, something that is quite expected given that the corruption-busting agency has the image of dragging its feet when it comes to the ruling Umno-BN. Similarly we have yet to hear anything meaningful from the Public Accounts Committee (PAC) in Parliament. In short, we have another sickening routine: the tabling of a damning report followed by a week of strong words and condemnations though one only finds these in cyberspace. We do have bad reports in the so-called print and electronic mainstream media, most of which are under the control of the ruling party. But these are limited just to agencies and departments. No one has the courage to call the ministers into question. This is incorrect. At least from the point of view of the Federal Constitution which puts them (departments) under the care of the ministers; something that is known as individual responsibility of a minister. As the civil servants are not elected, the ministers have to speak on their behalf. The guilty civil servant may be put before a disciplinary proceeding or may even face criminal charge but the minister in question cannot go scot-free. But what options do we have? We live in a system whereby most of the avenues meant to allow the notions of answerability and accountability are jammed and clogged. While some of the root causes lie in our feudalistic character, some others have been due to Umno-Barisan Nasional’s doing. They (BN-Umno) even went to the extent of hiding the report last year. This is, of course, a serious allegation. But I find it hard to believe this can happen in a country that is proud of her Federal Constitution. Under this supreme law, the Auditor-General is under a duty to submit the report to the Yang di-Pertuan Agong who has the responsibility of laying it before Parliament. Now when the report went “missing” something suspicious must have taken place. Sadly, until now we have yet to be told of what had happened. But the buck stops with the government which incidentally is helmed by the old grand party. It has to be said, however, that even when the report actually arrived in Parliament we have yet to see a real debate or actions taken about the wastage, irregularities and wrongdoings mentioned in it. But the reason is not hard to fathom: it all boils down to the fact that the person who heads the PAC comes from the ruling party. It is like having a football match between Malaysia and Singapore in Bukit Jalil stadium refereed by a Malaysian. The world over, especially in the United Kingdom, the PAC chief has to be from the opposition. The reason is not difficult to see. But Umno, which most of the time claims that the legislatures under its rule are world class, cannot see it! And when the Pakatan Rakyat-led Selangor state government offered the PAC chief’s post in the state legislature to Umno, former menteri besar Datuk Seri Dr Mohd Khir Toyo refused to take it, claiming that it has less power. The funny part of it was that the rules were laid down by Umno when it ran the state before it was trounced in the 2008 and 2013 general elections. To make matters worse, most media organisations are owned by Umno and other component parties in BN. Of course, some are not. These organisations cannot disentangle themselves from the Umno-BN tentacles as the party lays down the laws which are either biased or could be manipulated in their favour. Yes, both RTM – the public-owned TV system – and TV3 do carry reports about mismanagement and so on. But they are selective. The so-called live proceedings are only aired when Umno-BN MPs speak. They may, once in a while, have MPs from the other side but that is when these members jump ship or when their statements could be manipulated to score points against Pakatan. Apparently the system has been somewhat, to put it crudely, sodomised. It no longer works in the normal or natural way. But the sad thing is our people have never been exposed to other systems. Whatever it is, we have to pat Auditor-General Tan Sri Ambrin Buang on the back for working hard to have the report out on time. In the past, we used to wait for some years before it is out for us to see. But despite the good work, Ambrin has somewhat put a blot on his own good name when he came out with statements criticising the public for getting angry about the report's contents. He also appeared to be uneasy for putting the Umno-BN administration in an embarrassing position. Hence he made a statement which is tantamount to saying that it was all right for the police to lose arms and handcuffs. The auditor-general's job is to make report about how the money was spent. If the revelations put the sitting government in a bad light and it is voted out, there is nothing Ambrin could do. Without that unnecessary statement, Ambrin could have stood tall alongside luminaries like Tan Sri Ahmad Noordin Zakaria, one of his predecessors. The slight, unassuming and quiet man from Kelantan may not be able to match the speed with which Ambrin completed his report but he never sounded apologetic about his job. And Ahmad Noordin got another badge of honour: uncovering the bad loans committed by the government-linked company – Bank Bumiputra – in the Hong Kong BMF scandal in mid-1980s. Dr Abdul Aziz Bari is formerly professor of law who now teaches at the Faculty of Social Science, Unisel. DAP's Kluang MP Liew Chin Tong has described at least RM6.8 billion of the Prime Minister Department's 2014 budget as "near slush funds", alleging that the funds had scant details and were meant for political purposes. This includes a RM4 billion "facilitation fund", a RM1 billion "development programme", and RM900,000 for "community restructuring". No specific details were made available for these projects under the detailed federal expenditure budget, Liew (right) revealed. He also said that Minister in the Prime Minister's Department Idris Jala was wrong to say that the Prime Minister's Department's ever increasing RM 16.5 billion budget for 2014 was justified. "Malaysia does not practice a presidential system. Our constitution provides for a parliamentary democracy with a collective responsibility of a cabinet, of which the Prime Minister is the first among equals. But the PMD is now usurping the roles of other ministries," he said. The other questionable items, Liew said, include a RM200 million fund for "special projects", and "people-friendly project" for RM665 million. "The entire budget is filled with such discretionary black holes that can easily be turned into slush funds," Liew said in a statement delivered in Parliament today. He also said that it was unjustifiable to increase the Prime Minister's Department expenditure by 13 percent compared to the 2013 budget, when the overall budget tabled last Friday was only increased by 1.3 per cent. The RM4 billion facilitation fund, in particular, has been on the increase ever since it was introduced in the 2011 budget. It had a RM1 billion allocation in 2011, which was then increased to RM 2.5 billion for both the 2012 and 2013 budgets. Liew urged Idris Jala to explain the usage of these funds to the public, while also asking for the National Audit Department to look into this matter. Amnesty International and Suara Rakyat Malaysia (Suaram) have both slammed Malaysian officials for making “empty talk” at last week’s Universal Periodical Review (UPR) in Geneva even as its human rights position went out of whack with international norms. The human rights watchdogs demanded a concrete action plan from Malaysia, especially on upgrading the laws to allow more freedom for civil society to flourish in line with its aim to reach developed country status. At the very least, laws on the death penalty, freedom of expression and peaceful assembly, must now be strengthened in line with international standards, they said. “Malaysian government representatives present at the review failed to adequately respond to many of the questions raised by UN member states and were unable to give clear action plans or timelines on many of the key issues,” the NGOs said in a joint statement. After Malaysia presented its report at its second UPR last Thursday, representatives from about 103 UN-member states were each given a minute to present their views and recommendations, in a fast and furious manner, to Malaysia. Amnesty and Suaram said they hoped Malaysia took notes from the three-and-a-half hour sitting, which is held only once every four-and-a-half years. Almost a third of the UN members reminded Malaysia to ratify the core human rights treaties such as International Covenant on Civil and Political Rights (ICCPR), the International Covenant on Economic, Social and Cultural Rights, and the UN Convention Against Torture and Other Cruel, Inhuman and Degrading Treatment or Punishment (UNCAT). Malaysia has also yet to ratify the Rome Statute of the International Criminal Court, the 1951 Refugee Convention, nor the International Convention on Protection of Migrant Workers and their Families. While Malaysia has repealed some restrictive laws in recent years, there are ongoing human rights violations, in part resulting from an inadequate legal framework, the NGOs said. Chief among this was the failure to repeal the Sedition Act, promised since 2009, they noted. Eleven states - Austria, Canada, the Czech Republic, Denmark, Ireland, Japan, Poland, Russia, Slovakia, the United Kingdom and the United States of America - raised concerns or made recommendations on the lack of freedom of expression and assembly in Malaysia during its second UPR, they said. Other issues of concern which garnered attention were laws which allowed detention of criminals without trial, torture, ill-treatment and deaths in police custody and the mandatory death penalty for drug-trafficking. “In 2012 the government announced a de facto moratorium on executions, however, according to reliable sources, at least two people have been executed in 2013. These executions were shrouded in secrecy. Courts continue to impose death sentences,” they said. Amnesty International and Suaram also backed the establishment of an independent body to watch law enforcement officers and deal with complains of police acting out of line. I refer to the widely reported statement made by Dato’ JC Fong in Geneva few days ago on the status of NCR land in Sarawak and the issues related to the same. If the statement is accurate as reported, I am appalled at his blatant attempt to mislead the UN on the situation our indigenous people are facing in Sarawak. He tried to paint a pretty picture of a caring and responsible government putting the rights of the indigenous people above all other concerns but that could not be further from the truth. Why did he not mention the many NCR cases brought against the government? JC Fong boasted that the government has ‘recognised and protected indigenous people’s rights over land created by their recognized customs and practices’. What he failed to say is that the current government refuses to abide by the ruling of the highest courts in this country relating to the definition of Native Customary Rights (NCR). The Courts have held that NCR lands extend to an area wider than the temuda, to encompass the pemakai menoa and pulau galau but the State is repeatedly showing its ‘contempt of the courts’ ruling by continuing to issue provisional leases and timber licences over such lands and appealing judgments which favour native landowners. In his book ‘Law on Native Customary Land in Sarawak’, JC Fong wrote that the acquisition of rights to land is by custom or practice recognized by law ie clearing virgin jungle, planting and occupying the land continuously (at 3.16 and 3.18). However, he continues to insist that this custom and practice is confined to temuda only. It is JC Fong’s opinion (and the State) that this is the only ‘recognized customs and practice’ under the laws of Sarawak. In our two most recent cases heard in the Court of Appeal (Tamit Anjat and Nyutan/Luking), JC Fong persisted in arguing that the pemakai menoa is not considered NCR land, despite the Court having held to the contrary in earlier cases. In these two cases, (Tamit Anjat and Nyutan/Luking at the COA) the Court again held in favour of the native landowners. Obviously JC Fong did not inform the UN’s UPR that the Government is still doing all it can to restrict the claims of the indigenous people; instead he intentionally misled the UN by his rapturous rhapsody on the rosy life of the displaced natives of the land who have been overwhelmingly compensated and their lives uplifted by the ‘caring government’. Did JC Fong actually say with a straight face that the State’s consultation with the natives conform with acceptable norms and standards, and its efforts at resettlement of the indigenous people has in many areas ‘exceeded relevant international standards’? Perhaps he should try to live with the lucky resettled people for a week before he makes such a ridiculous and pompous statement. If the people really have been so thoroughly consulted and well provided for, why have there been so many protests against the Dams? As we all know, the protest against the Baram Dam continues as we speak. The 1.5 million hectares of NCR lands is, I believe, the old figure that does not take into account the Court’s decision that NCR includes pemakai menoa. This figure must be referring to temuda created before 1.1.1958 because the Government only recognizes temuda as NCR land. Further, the surveying of land, so proudly trumpeted by JC Fong, has brought dismay to landowners who were unaware of the repercussions of the s 6 perimeter surveys, which the State insists on carrying out, instead of the desired s 18 surveys which provide for individual titles free of any fees and ‘in perpetuity’. This farce of whitewashing the government’s poor treatment of the indigenous people serves no purpose except that of self-deception, that is now becoming so commonplace with the government of this state and country. If the State Government had hoped to gain some measure of integrity or credibility, the least it could have done was include some neutral legal experts in the Malaysian delegation to address the UN on the views of the opposing side. In this day and age, it is impossible that the international community is blind and deaf to what is actually happening in Sarawak. We have been attracting adverse publicity for the worst of reasons. I should be thoroughly embarrassed if I were Dato’ JC Fong.